For many of us, labels like “free-range” and “cage-free” on a carton of eggs bring to mind images of sustainably raised hens doing what hens do naturally: clucking, foraging, and scratching in lush, green pastures. But many consumers may be surprised to learn that free-range chickens often do not spend much, if any, of their lives frolicking in the sunshine. Egg production is complex, and labeling is confusing. Ferry Plaza Farmers Market customers can currently find both cage-free and pasture-raised eggs at the market. We at CUESA, the nonprofit that manages the market, plan to introduce some changes in 2012. The USDA does not regulate terms like “cage-free” and “free-range” for egg production. This leaves much room for interpretation by industrial-scale operations. Free-range and cage-free hens are typically kept in large barns or warehouses with thousands of hens per building. Any outdoor access is often limited to a small yard that goes unused by the hens and offers little vegetation or room for movement. But housing is only one aspect of an animal’s well-being. Industrially-raised hens, whether they’re in cages or not, are often subject to practices such as debeaking (a standard practice when hens are raised in a crowded environment), wing clipping (cutting feathers to prevent flight), and forced molting through starvation (done to regulate the timing of feather molting, which halts egg production). Their feed may include animal byproducts, antibiotics, and hormones. With conventional grocery-store eggs selling at $2 to $3 a dozen, consumers have grown accustomed to an artificially low price for eggs, with the costs externalized in the form of animal welfare abuses, environmental pollution, poor conditions for workers, and food safety risks. To find eggs from hens that are truly raised humanely and sustainably, consumers must look beyond labels, ask questions, and get to know their egg farmer. Encountering pastured eggs for the first time, many shoppers are surprised by the price, which can run $7 to $8 per dozen or more. Labor and feed costs factor heavily into the cost of production, particularly when farmers opt for organic feed. For producers, converting consumers to pastured eggs means communicating the costs of pastured production, as well as the value. 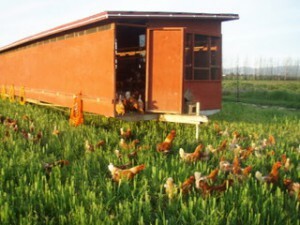 Pasture-raised hens are kept outside as the season and daylight hours permit, utilizing a movable or stationary house for shelter. They have constant access (as conditions allow) to fresh-growing palatable vegetation, with protection from predators when needed. While pastured farms are not regulated, producers generally avoid the use of hormones, antibiotics, and practices such as debeaking, wing trimming, and forced molting. Because the birds are raised outdoors, rather than in temperature- and light-controlled barns, seasonal fluctuations affect egg production, which in turn affects cash flow. Pastured egg producers can compensate through practices such as starting their chicks in late summer, but there is an inevitable slowing as the weather drops. Sowell estimates that his production declines to about one-fourth in the wintertime. The cost of feed is another huge expense in raising pastured hens, particularly those raised on sustainably sourced grains. 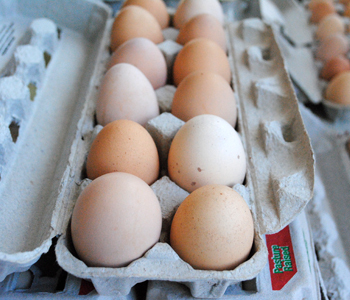 Marin Sun Farms, the market’s first pastured egg seller, has tried various feeds over the years. The biggest challenge has been to find GMO-free, organic grains that are local and affordable. “There’s no conventional work that’s been put into that, so it’s like inventing the wheel,” says founder and owner David Evans. “We’ve experimented at great cost with feeds that didn’t work out.” Recently, they discovered a promising local source for organic, soy-free grain, and in January 2012 they plan to transition. At Eatwell Farm, Nigel Walker says that his biggest expense in raising organic, pastured hens is also grain, but it’s an essential expenditure in sustainable farming. “I’m an organic farmer, and by buying organic feed, I’m supporting other organic farmers,” he says. In an effort to support these sustainable practices, CUESA will be adopting a new policy in February 2012 that will allow only pasture-raised eggs to be sold by farmers in our markets. We made this policy change because we support this humane manner of raising hens, and we believe pastured eggs are what customers expect to find at the farmers market. This new policy will have a number of impacts. As of February, Petaluma Farms, which produces cage-free but not pastured eggs, will no longer be selling at the market. It also means that we will have to adjust to the seasonal cycles of pastured egg production. Lastly, some Ferry Plaza Farmers Market shoppers will have to consider paying $7 or $8 a dozen for eggs if they plan to continue buying them at the market. Pastured chickens photo courtesy of Eatwell Farm. To learn more about the differences between free-range and pasture-raised eggs, watch this brief video from Lexicon of Sustainability, featuring David Evans of Marin Sun Farms.